Pitching is the same as flipping in that you can present your lure into tight spots with very good accuracy. You can also place your lure with out spooking the bass by keeping it on a low trajectory and softly entering the water. 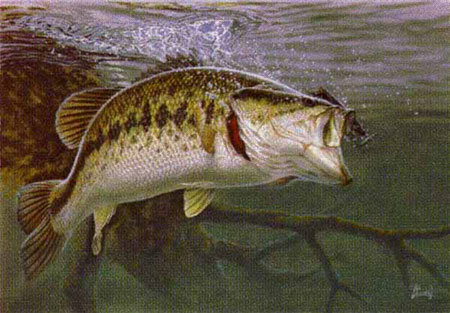 This is another one the main bass fishing techniques that I recommend for all bass anglers to learn and master. This technique will make you a better and more proficient bass fisherman. Your wife and family may think you have gone crazy but I would spend some time in the yard learning and practicing this technique until you are comfortable with it. Where flipping really limits the distance between you and your target, pitching will let you stay further back. I have seen pitches go upwards of 50 feet but it is much more accurate at 20 - 30 feet. To have the most accuracy with this technique, I recommend a longer rod. As with flipping, I prefer a 7’ to 7’ 6” heavy power rod with a fast action tip but you can get away with a bit shorter one if it fits you better. There are many rods on the market that are made specifically for this technique. Attached to this heavy rod, I like to have a smooth working and free spooling bait casting reel. The reel should be able to handle heavy line up to 30 pounds. Unlike flipping where I recommend 20 - 30 pound mono line, with pitching you can use most any line. It is important to size your line to the lure that you are going to be pitching. If the line is too heavy and you are using a smaller lure, the professional over-run (back-lash) will be a disaster. Keep in mind that lighter line is less abrasion resistant and could cause problems in heavier cover. The line that you spool up on your pitching rig should be matched to the conditions you will fishing in. A little experimentation goes a long ways here. That time spent in the yard should help you decide what strength line you will be needing. As with flipping, I like the Berkeley big game for this type of application. It is very good line at a very good price and comes on big spools so that I can re-spool my reels often with out breaking the bank. Put your spool in the free spool mode like you are going to make a cast. Make sure to “thumb” the spool and pull out enough line to take your lure into the palm of your free hand. Make sure that the lure head is pointing in the direction of your intended cast. With your reel still in free spool mode and the spool tension loose, hold the reel at roughly chest level and point the rod tip down toward the water. Swing the rod tip forward toward your target and continue upward pulling the lure from your hand. It is very important not to have too tight of grip on your lure at this point. THOSE HOOKS ARE SHARP! Try not to raise the tip of the rod too high as this will cause the lure to swing high and splash down hard. Try to keep the lure as close to the water as possible. Make sure that you have complete control of the spool by thumbing it. Apply just enough pressure so that there is no back lash during the cast. Stop the spool completely when the lure is about to reach your target and ease it into the water. You do not want to spook the fish. Once you have hit your target, let your rod tip down and let the lure sink into the spot. I like to let the lure sink to the bottom and then hop it up and down a few times or just shake it in place. Often times this will trigger the fish to strike. As with the flipping technique always be on the look out for hungry aggressive fish that hit your lure before it hit the bottom or the structure. Many times the fish will take that lure as it falls. Pitching is very similar to flipping in that it is basically just an underhand swing but it can be highly accurate. It should be used to target bass that are holding tight to cover. This technique allows the lure to sink vertically so that the fish sees the lure before they see the line.